Abstract. Large and effective reductions in emissions of long-lived ozone-depleting substance (ODS) are being achieved through the Montreal Protocol, the effectiveness of which can be seen in the declining atmospheric abundances of many ODSs. An important remaining uncertainty concerns the role of very short-lived substances (VSLSs) which, owing to their relatively short atmospheric lifetimes (less than 6 months), are not regulated under the Montreal Protocol. Recent studies have found an unexplained increase in the global tropospheric abundance of one VSLS, dichloromethane (CH2Cl2), which has increased by around 60% over the past decade. 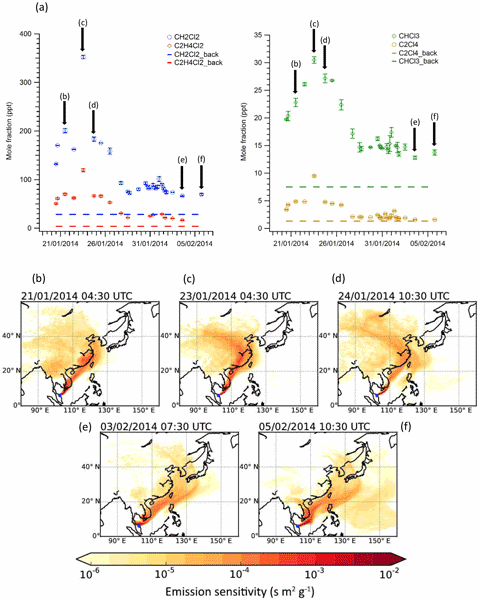 Here we report dramatic enhancements of several chlorine-containing VSLSs (Cl-VSLSs), including CH2Cl2 and CH2ClCH2Cl (1,2-dichloroethane), observed in surface and upper-tropospheric air in East and South East Asia. Surface observations were, on occasion, an order of magnitude higher than previously reported in the marine boundary layer, whilst upper-tropospheric data were up to 3 times higher than expected. In addition, we provide further evidence of an atmospheric transport mechanism whereby substantial amounts of industrial pollution from East Asia, including these chlorinated VSLSs, can rapidly, and regularly, be transported to tropical regions of the western Pacific and subsequently uplifted to the tropical upper troposphere. This latter region is a major provider of air entering the stratosphere, and so this mechanism, in conjunction with increasing emissions of Cl-VSLSs from East Asia, could potentially slow the expected recovery of stratospheric ozone. How to cite: Oram, D. E., Ashfold, M. J., Laube, J. C., Gooch, L. J., Humphrey, S., Sturges, W. T., Leedham-Elvidge, E., Forster, G. L., Harris, N. R. P., Mead, M. I., Samah, A. A., Phang, S. M., Ou-Yang, C.-F., Lin, N.-H., Wang, J.-L., Baker, A. K., Brenninkmeijer, C. A. M., and Sherry, D.: A growing threat to the ozone layer from short-lived anthropogenic chlorocarbons, Atmos. Chem. Phys., 17, 11929-11941, https://doi.org/10.5194/acp-17-11929-2017, 2017. 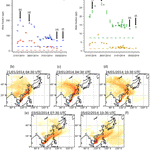 We have observed large amounts of man-made chlorine compounds in E and SE Asia and in the upper tropical troposphere. These relatively short-lived compounds are not controlled by the Montreal Protocol, but if significant quantities were able to reach the stratosphere, the long-term recovery of stratospheric ozone would be delayed. We have also identified an important atmospheric transport mechanism that can rapidly transport these chemicals from E Asia to the upper troposphere via the tropics.